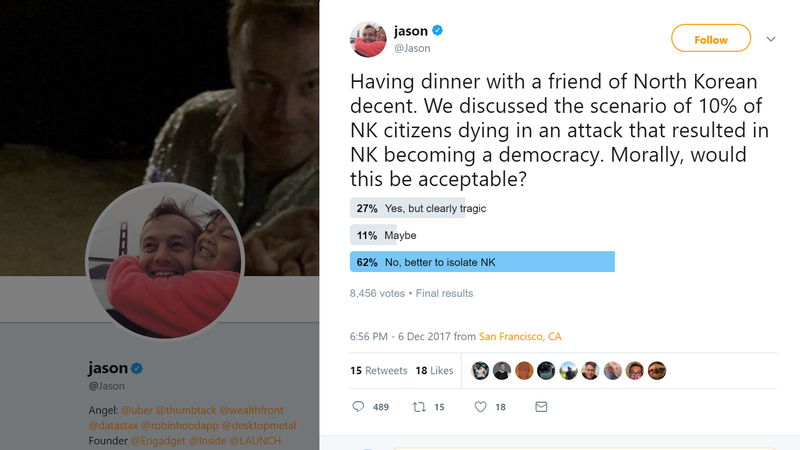 Jason Calacanis, founder of Engadget and investor in dozens of companies, including Tesla and Uber, would like to know if it’s morally acceptable for millions of people to die in a preemptive strike against North Korea. It’s just something that came up over dinner. Calacanis claims he does not advocate for war here, but in 2009 he tweeted, “Note to the world: it’s time to deal with North Korea,” and in 2010 he tweeted, “it’s time for the world to unite and overthrow this group of maniacs” in North Korea. In June of this year, he ran a poll asking the odds of President Donald Trump “taking military action” against North Korea. But none of those previous tweets directly questioned the value of North Korean lives like last night’s tweet. While risk assessment is a very real aspect of war, the flippant nature in which Calacanis presents the lives of millions of people in this Twitter poll is disturbing, not even taking into account the millions more who would suffer from war with North Korea. For someone with nearly 300,000 followers, Calacanis shouldn’t be so callous. Two-thirds voted “no” in yesterday’s Twitter poll. Calacanis has recently publicly spoken about his interests and vision for companies he has invested in, like Tesla and Uber. In August, he went on CNBC to discuss what it was like being one of the first people to have the new Tesla Model 3 and what the car was like. In a different interview with CNBC, Calacanis discussed his vision for a hypothetical merger between Tesla and Uber. Jalopnik has reached out to both companies, as well as Calacanis, for comment and will update when more information is available. Full disclosure: evidently Calacanis referred to Jalopnik as “jalopsuck” back in 2010.